Embossed, Gold Leafed, Double Sided Postcard has a Velvet front. 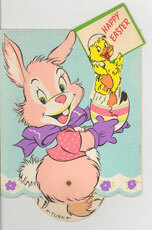 The flag the bunny is holding and the words "Easter Greetings" are Gold Metal Appliqués. Mfg. International Art Publ. Co.
Embossed Postcard : "Risen for thee Oh! may'st thou see his love divine Upn the pathway shine." French Folded Cut Out Card has real yellow fir for the ducks body and head. Card reads: "Happy Easter! This is confidential, It's just between us two --" Inside reads: "I think of you an awful lot because I think a lot of you! Happy Easter!" Embossed Postcard reads: "Joyful Easter"
Embossed, Gold Leafed Postcard reads: "Easter Greeting"
French Fold Mechanical Card has a turning wheel held in by a metal grommet. Turning the wheel makes the little Easter Chick jump in and out of his egg holding a sign that reads: "Happy Easter". Inside card reads: "I love you lots and lots because you're dear to me and I'm wishing that your Easter is as grand as it can be!"